that diet and exercise cannot target! Cryolipolysis is better known as “Fat Freezing”. Prefer to take the less invasive and quicker route to fat reduction? Fat freezing with our equipment delivers excellent results especially for those stubborn areas we all want to reduce! We use the new revolution in fat reduction; Cooltech™ and Clatuu™. These two systems are at the forefront of Cryolipolysis treatments. Faster and more efficient treatments equals better results for you. Fat freezing has little to no downtime unlike liposuction which has a substantial recovery period and many possible complications. Its back to work straight away with our system! Cryolipolysis has been proven in clinical trials to destroy fat cells for good. Surrounding tissue and skin are not damaged in the process. Fat freezing is now even more tolerable with our pain relief option! *For a detailed explanation of the term “application” and the pricing please see the treatment question section. Cryolipolysis or “fat freezing” is a scientifically proven non-invasive method of effectively reducing fat by permanently removing fat cells. The Cooltech™ & Clatuu™ fat freezing systems are a safe easy treatment solution for people with difficult to treat areas of stubborn fat that no amount of exercise or dieting will remove. Our fat freezing devices are at the forefront of this proven fat reduction technology yielding superior results and faster treatment times. As we have the advantage of having both of the most advanced systems available we have an applicator for every area of the body making this combination the most versatile available, which simply means we can treat more fat in more areas! There is no doubt that this is the most effective non-surgical alternative to liposuction surgery! Our fat freezing technologies are at the forefront of this proven fat reduction technology yielding superior results and faster treatment times. As we have the advantage of having both of the most advanced systems available we have an applicator for every area of the body making this combination the most versatile available, which simply means we can treat more fat in more areas! Fat freezing is a revolutionary treatment with proven clinical results. It takes advantage of the fact that fat cells cannot survive at a particular low temperature whilst our other cells can. So simple but so effective. Once the fat cells die they do not return after our teenage years. Up to 25% fat loss per area in one treatment! IS FAT FREEZING SUITABLE FOR ME? Cryolipolysis is best suited to people who have stubborn areas of fat that have been resistant or difficult to remove with previous episodes of diet and exercise. Ideally someone who is within 15kgs of their ideal weight. Diet and exercise is a great adjunct to fat freezing but not essential for the treatment to be effective. Fat freezing is not recommended for people who are severely over-weight as other interventions should be applied first until a weight range closer to ideal is achieved. You should start to see results from 4 to 7 weeks following your fat freezing session. This is of course dependent on how fast your body metabolises the dead fat cells. Full results should be evident after a 12 week period. Up to a 25% reduction can be seen in the area being treated from one session. HOW DOES THIS SYSTEM WORK AND WHERE DOES THE FAT GO? The Cooltech™ and Clatuu™ systems are extremely effective at targeting just the fat cells and not surrounding tissue. Fat cells are lowered in temperature to around -8 degrees which causes them to crystallise. These cells are now metabolised and removed by the lymphatic system. The fat cells are now essentially dead and our body removes them for good. Liposuction removes fat cells in a mechanical and brutal process, whereas fat freezing cleverly uses the body’s metabolic processes to do the job in a much more efficient and less intrusive manner. Using Cryolipolysis technology fat cells are chilled so that the body’s apoptosis process is stimulated to rid the body of the damaged cells. As with liposuction the results are permanent as long as some form of diet and exercise are maintained. After Puberty we have a set amount of fat cells. Once the fat cells are removed by Cryolipolysis they cannot return. However if diet and exercise are forgotten, remaining fat cells can enlarge. But as a percentage have been removed the area will not enlarge to the same degree as it may have before treatment. WHICH AREAS ON THE BODY CAN BE TREATED WITH OUR SYSTEM? Cooltech™ is the most recent development in fat freezing treatments. This system has more applicator styles than any other machine on the market and is therefore capable of treating more areas on the body. Clatuu™ is a proven system yielding excellent results and has its own advantages on certain body types. This enables us to select the perfect applicator for the area being treated for maximum results. plus multiple areas at once. WHAT HAPPENS DURING MY FAT FREEZING TREATMENT SESSION? A specially designed single use gel pad is applied to the skin before treatment to protect the area and regulate the temperature on the skins surface. The area being treated is then drawn into one of the machines specially designed hand-pieces and cooled to a specific temperature for a period of 45-70 minutes. The fat in that time is now being safely crystallised and the area will go numb in minutes. You may experience a pulling sensation as the skin is drawn up into the hand-piece. Following this the area is massaged after the applicator is removed to assist the body’s removal process. There is some discomfort during the initial cooling process and some again at the last stage during the massage period. We now have Entonox® pain relief available for clients who find this stage difficult. Not everyone does. ARE ALL FAT FREEZING TECHNOLOGIES EQUAL? Cryolipolysis machines now come in three popular forms with regard to the top serious contenders in the market. Coolsculpt™ has been around for the longest and has delivered good results for a number of years. 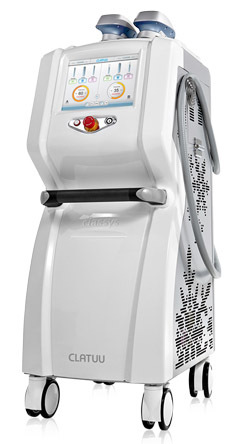 Clatuu™ is a newer machine which works on the same principles as Coolsculpt™, but has dual hand-pieces and offers 360 degree cooling. These two improvements gave Clatuu a definite advantage offering quicker and more effective results. Clatuu has proven itself as a top contender in the industry. Cooltech™ is the newer technology of all three, which has all the benefits of the Clatuu™, but also has 5 different applicator designs which means this machine can target any area of the body, even under the chin. 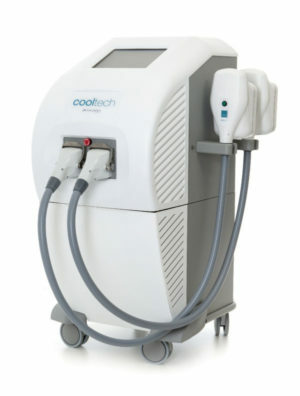 Cooltech™ have taken the revolutionary treatment of fat freezing and refined it even further. We want to be able to provide the most effective cryolipolysis treatments available, therefore investing in both leading systems. These are both registered with the Theraputic Goods Administration in Australia. Coolsculpt is the only other system registered. Make sure you are only considering these systems when making your choice. WHAT IS AN APPLICATION AND WHEN CAN TWO AREAS BE TREATED AT ONCE? One treatment session takes approximately 60-70 minutes to perform, depending on the system being used. Application means one area treated with an applicator per session. For example; “one application” is the use of one applicator on an area of the body in a single treatment session of 70 minutes. Sometimes it is possible for us to treat two areas at once thus this will be “two applications” in one session. If this occurs we offer a discounted price for the double application. When you are having your consultation with us and we determine accurately which areas you would like treated and the fat deposits are assessed, we can advise at this point if one or two applicators can be used in the single session of 70 minutes. Some body types and shapes will make it not possible to fit two applicators at the same time on the abdominal area for example. This will all be explained in detail to you when we see you. Fat freezing can have two periods of time during treatment that can be quite uncomfortable for some people, the initial phase when the area being treated is lowered in temperature to around minus 7 degrees and then at the very end of the treatment, when the applicator is removed, during the massage element. Some clients find this latter time particularly painful (not all). We now have optional pain relief available which lowers the discomfort considerably. Entonox® analgesia can be used for acute short term pain relief and is well suited to Cryolipolysis treatments. It is administered as needed by the client, inhaled as a gas. You may have heard of it previously as “gas sedation”. If you have had fat freezing done previously and found it too difficult to do again because of the discomfort, this will make having more treatments possible with us! Other application combinations quoted on consultation.